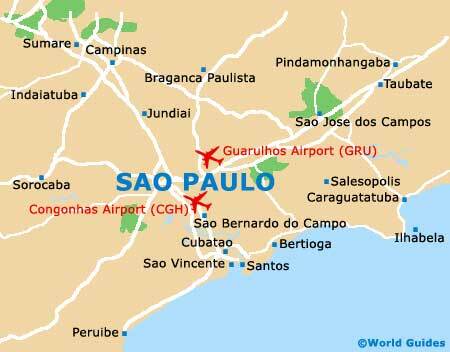 The city of Sao Paulo is huge and there really is no shortage of accommodation, with a number of areas where hotels are especially clustered. In comparison to leading cities within Europe and the USA, hotels in Sao Paulo are not expensive and quite reasonably priced, particularly those around the Avenida Sao Luis and the Rua Augusta, close to downtown. Bear in mind than the summer months (December through February) can actually be fairly quiet time in the Sao Paulo, when Paulistanos choose to take their holidays. This is the time when accommodation is usually at its cheapest, with hotels offering weekend discounts of as much as 50 percent at times. 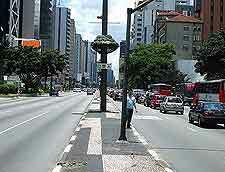 Most of the cheapest lodging within Sao Paulo does tend to be in the seedier areas, between the Praca de Republica and the Estacao da Luz, where budget hotels and accommodation options line the Rua Santa Efigenia and the Rua dos Andradas. Therefore, it is often worth paying just that little bit more to find a more appealing location, where you can walk safely at night, such as the very recommended Jardins neighbourhood, along the Rua Oscar Freire or the Rua Vergueiro. The Hotel Joamar is located on the peaceful pedestrianised street of Jose de Barros, and offers budget accommodation and a friendly service. 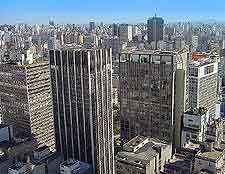 Both the Hotel Rei Paulista on the Avenida Paulista, and the Hotel Municipal Palace on the Avenida Sao Joao, are further, reliable lodging options in Sao Paulo. Sited on the Rua dos Franceses and close to the Avenida Paulista, accommodation doesn't come any cheaper than the Sampa Hostel, which enjoys an enviable setting, close to the action of Sao Paulo city centre. Many of the best two and three star hotels in Sao Paulo tend to be concentrated around the Praca de Republica, such as the Excelsior on the Avenida Ipiranga, or the Othon Classic on the Rua Libero Badaro. 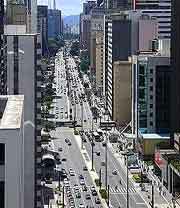 The Avenida Paulista is generally regarded as one of the most desirable parts of Sao Paulo and so mid-range hotels are in good supply within this area. The Metropolitan Plaza on the Alameda Campinas is one hotel worthy looking out for.